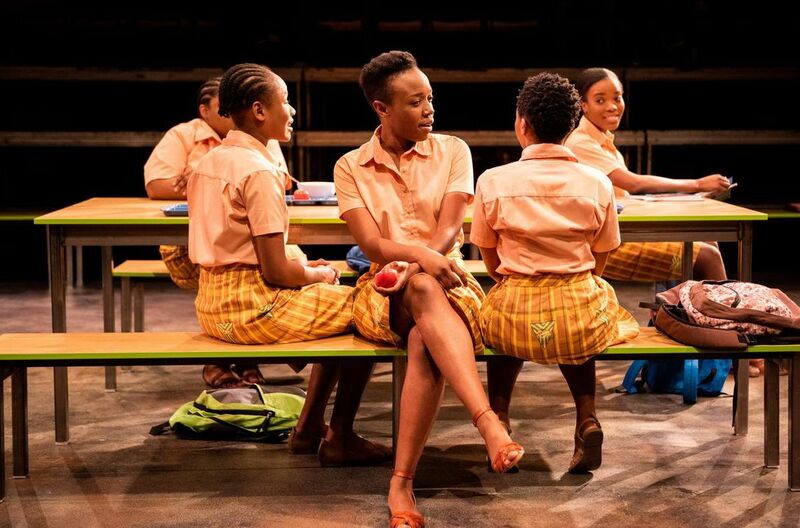 Set in 1986 at an elite Ghanaian girls boarding school, Jocelyn Bioh’s School Girls; or, the African Mean Girls Play is steeped in Queen Bee pettiness and teenage politics. An Obsidian Theatre production in association with Nightwood Theatre, Director Nina Lee Aquino masterfully delves into the complexities of teenage female relationships, brought to life by an outstanding ensemble cast. The chance to compete in the 1986 Miss Universe competition as Miss Ghana, an opportunity to be vaulted into a world of international celebrity, has group leader Paulina (Natasha Mumba) desperately trying to hide her insecurities through cruel power grabs. She leans on the adoration of cousins Mercy (Bria McLaughlin) and Gifty (Emerjade Simms) to leverage social capital against her “best friend” Ama (Rachel Mutombo) while manipulating young Nana (Tatyana Mitchell) to do her bidding through threats and humiliating remarks aimed at Nana’s body size. Paulina’s tight control over their group begins to slip with the arrival of new girl Erika (Melissa Eve Langdon), whose recent relocation from the United States, wealth, and light skin, already bears the worldliness that Paulina so desperately wants for herself. The power dynamics within the girl group are further exasperated when the elegant Miss Ghana recruiter (Allison Edwards-Crewe) clearly favours Erika over Paulina as a potential contestant. Issues of shadeism, privilege, and racialised beauty ideals shape the girls relationships, and reveal the larger and longer standing systemic conflicts that inform the girls’ lives. Bioh makes use of 1980’s pop culture references as well as the girls’ personal effervescent charisma to inject humour into the work, though the exploration of Paulina’s attempts to seek love, attention, and validation against the backdrop of West Africa’s colonial hangover is devastating. The empathy and care of the girls by headmistress and mother figure, Francis (Akosua Amo-Adem) anchors the work and provides an emotional pillow for the conflict to rest on, as Paulina’s reach for Western upward mobility slips from her grasp. Outstanding scenes include the dream like fantasy pageant with the girls in 80’s era prom dresses promenading on their school cafeteria dining tables; the humorous Whitney Houston sing-off as an attempt to impress Eloise, the Miss Ghana recruiter; and the popcorn eating and Miss Universe pageant watching party that reveals the deep desire of all the girls to see themselves reflected on what they perceive to be the most elegant and beautiful world stage.